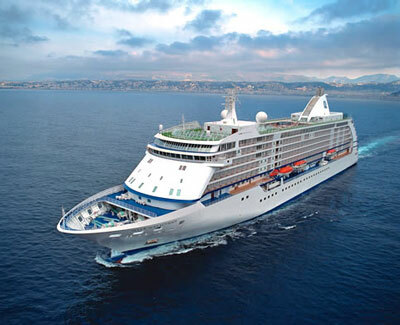 All the facilities and activities of larger cruise ships in a refined, luxurious, small-ship atmosphere. Imagine a vacation that’s about the journey, not simply the destination . . . where the words "Hurry up and wait" have no place. If traveling in style—the way travel was meant to be—truly is your goal, then Regent Seven Seas Cruises will fit you like a silk glove. The catch phrase of this ultra-deluxe, small-ship cruise line is "Luxury goes exploring," and you’ll soon discover the relevance of that philosophy. Every step of the way, as you wander from port to port, you’ll be immersed in the thoughtful, elegant, and pampering lifestyle that sets Radisson cruises apart. Every one of the line’s ships is designed to wrap you in cruising comfort from the moment you step on board and are warmly greeted with a welcoming glass of champagne. Each ship is steeped in luxurious touches: furniture of rich pearwood and mahogany, gleaming marble baths with hand-milled soaps, private balconies, original art, Le Cordon Bleu® cuisine. And, with one of the highest crew-to-guest ratios in the industry, service is always discreet, accommodating, and friendly. Special requests are honored with a smile. Coffee on your private balcony at sunrise? Never a problem. Special anniversary or birthday? Staff members will dedicate themselves to making yours a night to remember. Beyond your ship, an entire world waits to be explored. All told, Radisson sails to more than 300 fascinating ports on six continents!